Low bounce, low density, low price! Same Softi benefits, Larger 7" size! Non-sting coating for safe play. Low bounce, low density foam, low price! Now you can get the same Softi benefits — a non-sting, easy-grip coating that's virtually tear-proof — in a larger 7" size! Our softest ball is best suited for Pre-K and elementary aged kids. Each ball weighs about 95 grams. 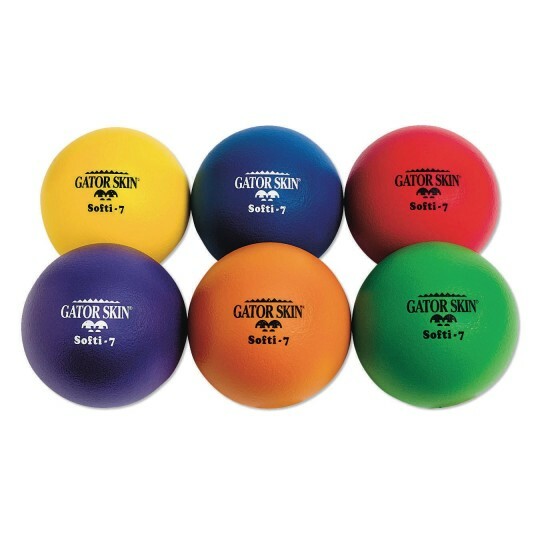 Set of 6 balls, one of each Spectrum™ color. Certified Latex Free. Non-sting coating is a proprietary polyurethane. This product is used during game time at our AWANA meetings. We use this for dodgeball tournaments...work great! These are the best balls for dodge ball. These are the best balls that we have found for dodge ball. They don't hurt kids because they are so soft and light but they can still be thrown hard and far from one end of the gym to the other. We have eliminated all other balls for when we play dodge ball we call it murder ball and the injuries have dropped dramatically. I have been usng these balls for 20 years in after school and camp programs. A great ball for active play. They are durable and safe for children.